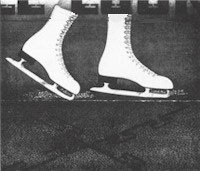 Ice skates often ruin "off-ice" areas with their sharp blades. Now our special-designed ice skate-proof interlocking, formulated rubber tiles can preserve those areas against cuts, wear and tear, while the color through-and-through resists fading. Easy-to-assemble interlocking tiles form walkways, runners and even wall-to-wall configuration. Medal Winner is 7/16" thick with molded pebble-grain surface makes tiles easy to clean with soap and water. The border tiles feature beveled safety edges and are 12" wide so as not to pull loose or create tripping hazards. Available in 3 popular styles for creation in any size and can be cut to conform to any shape. Color Choices: Off-Ice Blue, Off-Ice Green, Off-Ice Tan, Off-ice Burgundy, Off-Ice Grey, Off-Ice Terra-Cotta Red, Off-Ice Brilliant Red. Sizes: Center Tile = 24"x24" (4 SF per Tile); Corner Tile = "L-shaped" 3 SF with two 24" beveled safety edges; Border Edge Tile = 12"x24" with one 24" beveled safety edge 2 SF. Inside Corner = 12"x12"
Movable:Want to move them? No problem - they're easy-to-disassemble too. Specifications: Click HERE for Architectural Specifications. Prices are exclusive of shipping charges. Deliveries to NY, NJ or CT will have applicable Sales Tax added. How to Order - Provide dimensions of area(s) to be covers or total square footage of are to be covers and contact name, organizational name, phone and fax numbers, e-mail address, destination city, state and Zip Code for the freight part of the quotation. Thank you.